Description: Finney's Greatest Sermons on Revival Through Prayer. "There are two kinds of means requisite to promote a revival: the one to influence man, the other to influence God. The truth is employed to influence men, and prayer to move God. When I speak of moving God, I do not mean that prayer changes God's mind, or that His disposition or character is changed. But prayer produces such a change in us as renders it consistent for God do what it would not be consistent for Him to do otherwise." 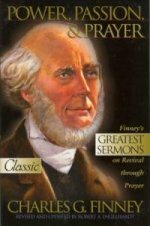 (Charles Grandison Finney) Eleven of Finney's most famous sermons are contained in this one treasured volume. They will stir your heart and soul for revival.